XPrize has said that it has chosen to focus on the early detection of Alzheimer’s disease for its next Grand Challenge, to be launched next year. The announcement was made at its annual Visioneers Summit where five proposals for future open innovation challenges were evaluated. The team focusing on Alzheimer’s disease received the highest honors for their proposal for a multidisciplinary development of early detection technology that is less invasive. The fatal illness is a huge problem the world over affecting nearly half of individuals who are over 85. The other four finalists – Clean Air, Cybersecurity, Evolving Our Democracy and Zero Waste Mining – have been earmarked for future incentivized prize competitions. In the six months leading up to the summit, the five teams worked on their proposals and strategies. They were evaluated by a group of mentors that included corporate and political leaders, technologists, artists, renowned scientists, and entrepreneurs. Their evaluations were based on numerous criteria. 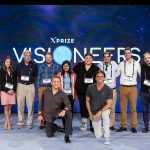 “Similar to a startup where an entrepreneur pitches a new commercial product to a group of VCs and investors for profit, the Visioneers process instead features a Bold Innovator who shares an impact proposal – for how an XPRIZE may drive exponential impact on a grand challenge facing humanity – to a network of prominent mentors,” said Marcus Shingles, CEO of XPRIZE. Between now and the launch of the open innovation challenge XPrize and interested parties will help the Alzheimer’s team come up with a competition structure and find a sponsor for the prize money.